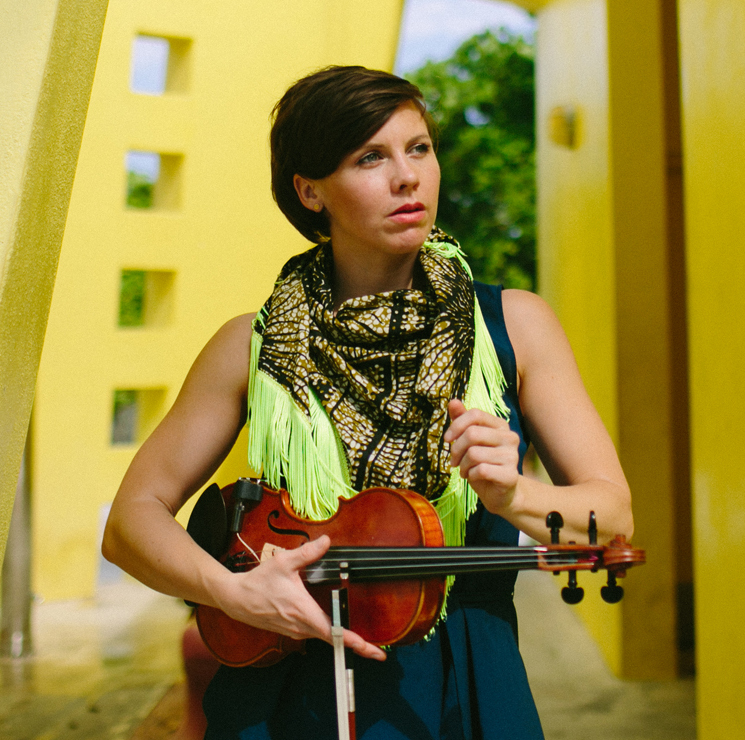 On Friday (February 26), solo and Arcade Fire violinist Sarah Neufeld will finally follow up her excellent solo debut, Hero Brother, with The Ridge, an album on which Neufeld embraced a new process that replaced the more classical bent of her debut with a more "impulsive, carefree and light-hearted energy." "This time around, though, I think I was drawing on other influences. I was hugely big into, and still am into, the world of minimal techno, dance music — I've listened to more Aphex Twin than anything else in life. Yes, I was raised on Bach, but I've been into Aphex Twin from the age of 14, and there are all those influences you might never really guess, listening to material that's comprised of very organic string work. I wasn't thinking so much about the giants of modern classical or minimalism." Which isn't to say that The Ridge is an electronic record. In fact, Neufeld says she and percussionist collaborator Jeremy Gara (Arcade Fire) tried to incorporate electronic elements into the record, but they didn't quite fit. "It felt like we were trying to squeeze something into a box, so we threw it all away. He just started playing drums, and it was perfect." The drums are just one fundamental new element that Neufeld incorporated into the new record; The Ridge also finds her adding her high, breathy voice to the mix, which adds a compellingly human dimension to her already expressive playing. And while Neufeld says that she purposely avoids trying to sound like other performers, it was easy for her to pinpoint exactly whose voice her high, breathy alto-soprano took after. "I was thinking, 'Hey, I'm singing quite a lot like Liz Fraser of the Cocteau Twins. But that's okay. I love her!' That's how my voice sounds, and if there are going to be comparisons, that's a fine comparison. We all sound like our forebears a little bit." Thematically, Neufeld says the record ties together a number of "loose threads" that helped shape its title. "I was interested in the physical aspect of ridgelines, whether it's on a landscape, or the way animals follow them — I'm particularly drawn to high points on the land. I'm also fascinated by the anatomical ridge at the back of the skull, and where it meets the neck. It's totally my Achilles heel. I have so much pain there, as a violinist; I find it so interesting how much people feel there. I was kind of relating those two ideas a lot in the record." More importantly, though, Neufeld says The Ridge confronts and questions our own sense of priorities when it comes to our place in the world. "It's been a pretty big moment for everybody kind of slowly waking up the fact that climate change is real and that we need to stop being idiots. So there was a little bit of that — how can there not be? How can we write about anything and express ourselves without first being a little bit more awake to our reality? It's pretty nuts." Check out Neufeld's upcoming tour dates, which include shows in Saskatoon, Winnipeg, Toronto, Montreal and Quebec City here. Listen to "Where the Light Comes In" below. The Ridge is set to arrive via Paper Bag Records. Sarah Neufeld "Where the Light Comes In"